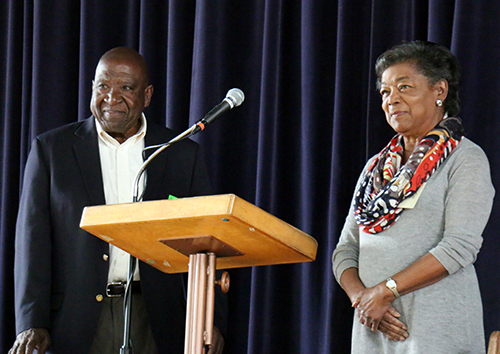 Freedom Riders Robert and Helen Singleton recently visited Immaculate Heart and shared their experiences with the Civil Rights Movement, which helped to dismantle much of the racial segregation in America. Helen Singleton, a policy analyst, said she had always found racism distasteful. She explained that many of her convictions stemmed from the family trips she would take to her grandparent’s farm in rural Virginia as a child. Before every trip, Helen’s mother would spend nights preparing and packing food that would feed eight children for 14 hours because the restaurants along the bus route refused to serve colored people. To Helen, these practices did not reflect the promises of the Declaration of Independence that she had so avidly memorized. Instead, these practices echoed the backdated ideas of a dark society. Robert Singleton, an associate professor of economics at Loyola Marymount University, told students how he, too, felt the racism ingrained in 1950s Virginian society. As a young man stationed at military base there, his superiors would continually advise him to stay out of the city because black individuals were not allowed in, except on designated days. Even on the designated days black individuals were allowed into the city, they still faced an immense amount of violence and derogatory racial slurs. Robert, being the brave young man he was, chose to ignore the advice and quickly realized that fellow white Americans saw him as an outcast. Robert and Helen’s experiences in Virginia did not end in vain. Instead, they fueled their activism that would prove to become an integral part of their lives. After serving in the military, Robert enrolled as a student at UCLA and brought his wife, Helen, to California. There, he joined the local NAACP and quickly became its president. Then, in 1961, he and Helen started recruiting young students – black and white – to join their “Freedom Rides” through the Deep South. The rides began in Washington, D.C., and were expected to end in New Orleans. The purpose of these rides was to end racial segregation that pervaded local southern communities despite the fact that the U.S. government had already declared that segregation on interstate buses was unconstitutional. As the Singletons, along with the local UCLA students, traveled to the other side of the country to sit in white-only seats, restrooms, and restaurants, they were fully aware of the violence and imprisonment they would face. However, these threats did not dissuade them because their goal was to end inequality. Helen recalled how she sat on the bus without fear for her safety. Even as southern police escorted her to a lonely female prison, she knew that her actions reflected America’s motto “All Men Are Created Equal,” and that was the goal she wished to achieve. On July 30, 1961 the Singletons and 300 other Freedom Riders were arrested in Jackson, Mississippi, and fined and incarcerated in Parchman Penitentiary. In the many days they spent in prison, Robert and Helen Singleton realized that the number of Americans that supported their cause far surpassed those people that resented them. Religious leaders would always visit the prisons and leak information about the outside world even though they were forbidden from doing so. Additionally, civilians around the prison would habitually throw food through the prison cell windows in order to feed the brave riders who spent days without proper meals. Although Robert and Helen were imprisoned for many days, their actions exemplified the social imprisonment many African Americans faced on a daily basis. After the Freedom Rides, the Singletons returned to California and continued to promote equality by challenging Los Angeles’ discriminatory practices in restaurants, apartment rentals, departments stores, and barbershops. To this day, they urge young people to stand up for their rights using peaceful means to do so. 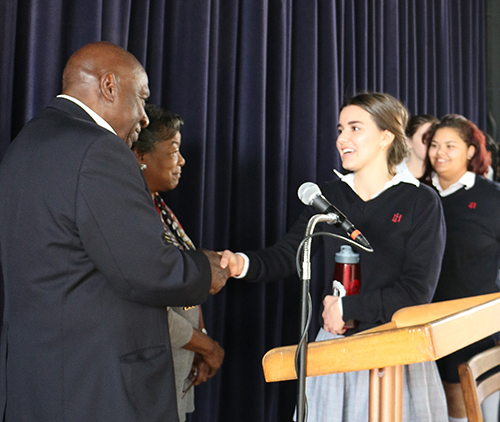 Robert Singleton advised students to use tools such as social media to spread the word about injustices worldwide. To him, the world is an evolving place, and he encouraged students to use whatever new peaceful medium is available to protest injustice. The Singletons meet with students after their presentation. The presentation by the Singletons was arranged by Immaculate Heart librarian Tracie Thomas. Photos courtesy of Kristy Suzuki.